The choice, conformity or difference? Last week most of the country experienced heavy fog. Certainly, if you live in London we have had some real ‘pea soup’ mornings. The other morning there was a deep fog around my house, so much so I could not see the houses opposite. I absolutely knew there were buildings just beyond but I could not quite get my mind around the fact that the world seemed to end just outside my window. It felt like the buildings had disappeared; even though logically I understood the fog was obscuring them. Most disorientating. This is one feature of our brain and it impacts how we see things at work as well as weather. Dean Mobbs, a neuroscientist at Columbia University in the USA has illustrated this in a talk on purpose, beliefs and motivation. Showing pictures, we have all become familiar with, like the one below, he discussed his research on how the brain distorts our motivation based on the beliefs we hold. His research suggests that once we see something and believe it is right it is very hard to change that perception. 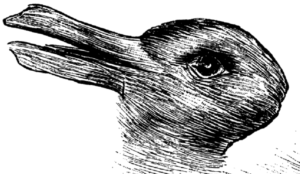 A bit like the fog and the illustration, is it a duck or a rabbit? But in an organisational context this distorted perception can have consequences. Sometimes undesirable ones. Think about the young emerging leaders in your organisation, or maybe you are one. it is hard to change beliefs which have led to success. Many young professionals achieve success through working largely on their own, coming up with ideas and carefully executing them. 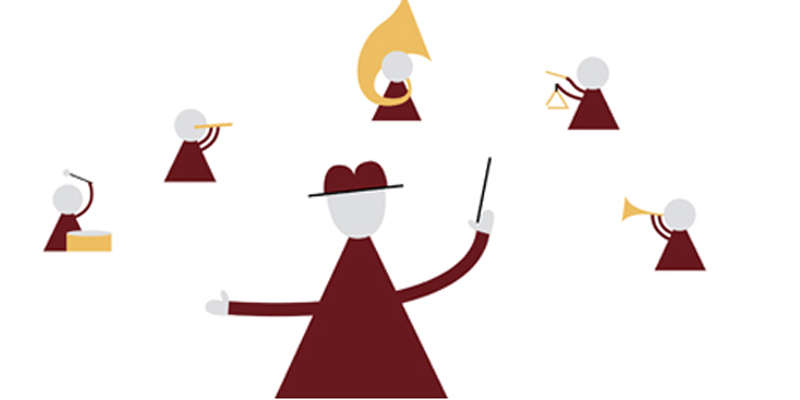 As their career progresses these work habits can get in the way. Helping young professionals to change their beliefs about success and encourage them to become a more collaborative leaders can be a challenge. We have all seen young leaders who succeed through hard work and enormous drive. There was little left for nurturing people or being sensitive to their needs. It takes a good boss or some other insight to break this work habit. One of the common themes from both the science and our observations about emerging leaders is the importance of purpose. And it’s even more important to make that a shared purpose. Mobbs’ research suggests that when people share a purpose they feel rewarded from the sense of relatedness or social connection generated through working to achieve it. This activates the reward centres in the brain and injects dopamine the neuro-chemical associated with reward. In addition, when we perceive people as like ourselves, people who share our goals and beliefs, we again activate a sense of reward. Our Success Profile research suggests there are several ‘secrets of success’, those things we see time and time again in the most successful leaders. These ‘secrets’ share much with the science. Including creating a clear shared purpose, repeatedly telling the story of why the team are doing what they are doing, how they execute the purpose, inviting people to join the journey, embedding conviction to get through the hard times and getting people involved at multiple levels: see, hear, feel. In short the most successful leaders need purpose, energy, and edge to enable others to execute. Many businesses struggle to convince leaders to work more on purpose and social connetion. The neuroscience is giving us additional weapons to use. It is no longer the ‘soft stuff’ but truly the hard stuff. Hard to have the courage and the clarity to see through the fog and harness a personal sense of purpose to make the changes happen. And for emerging leaders it is much more courageous to change what has been a winning set of beliefs and develop a new approach. Should you buy red sneakers for work and start behaving oddly?